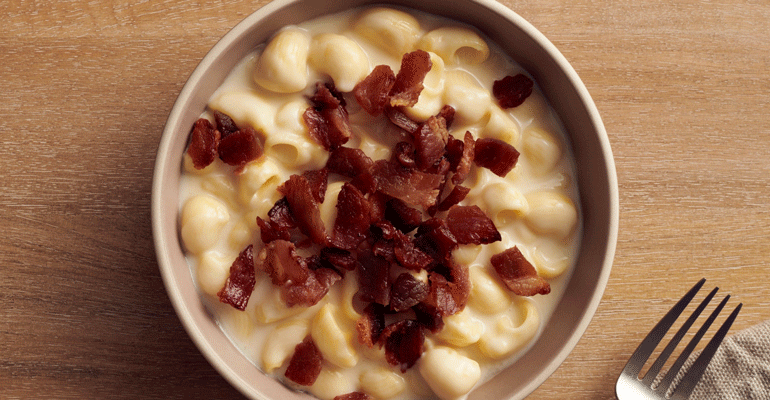 On the heels of expanding its in-house delivery fleet to 1,300 stores nationwide, Panera Bread is enticing diners with a delivery-only LTO: Bacon Mac & Cheese. Today through June 26, the cheesy dish, topped with thick-cut crunchy pieces of bacon, will be available for delivery customers. CEO Blaine Hurst said the limited-time offer makes the chain’s classic Mac & Cheese dish even more tempting for customers, especially when it can be delivered directly to their doors. In early May, the St. Louis-based bakery-cafe chain expanded its delivery program to include about 13,000 drivers and employees. That’s up from 10,000 delivery-related jobs since the end of 2017. Meals can be ordered for delivery in 43 states using the Panera Bread app or website. Delivery is driving the company’s digital sales, which currently account for 30 percent of total sales, the company said. Digital sales also include kiosk orders. By creating its own fleet, Panera is bucking a trend in which most restaurant chains are turning to third-party delivery partners, which can take a significant cut — often as much as 30 percent — for their services. Panera has more than 2,000 restaurants.